Trump Tried to Drive Obamacare Premiums Up. They Went Down. Trump Tried to Kill Obamacare by Driving Premiums Up. Instead, They Went Down. “Obamacare is finished, it’s dead, it’s gone,” gloated President Trump last year, “There is no such thing as Obamacare anymore … It’s a concept that couldn’t have worked.” Trump was highlighting the anticipated effect of his many moves to undermine the hated law that he had failed to repeal. He had withheld payments to insurers that they were owed under the law, allowed healthy customers to be skimmed out of the customer pool with cheap plans that would raise rates for others, virtually eliminated the outreach budget to enroll customers in the exchanges, and would later repeal the individual mandate. All these steps were intended to destroy the economic basis for making its individual market exchanges work. Yesterday, the department of Health and Human Services revealed that premiums on the exchanges for 2019 policies are actually dropping. The Department’s figures also reveal other signs of health in the exchanges: insurers who had left the markets are returning to offer plans, and the number of regions with only one insurer has fallen. The law’s viability has been a point of intense dispute for years. Conservatives had two reasons to oppose Obamacare. Philosophically, they objected to the idea of expanding government in order to create a new social benefit. Politically, they wanted to deny credit to a Democratic president. But, since neither of these arguments had much persuasive power with the electorate — which agreed with the goal of covering the uninsured, and tends not to support politicians who openly root for the failure of the opposing party’s program — they instead settled on a different argument. They insisted Obamacare could not work. Millions of words were spilled over the years in an attempt to establish the strident belief by — as far as I could tell — the entire conservative movement that Obamacare was a “train wreck,” conceptually unworkable. It was a monstrosity! You were forcing people to buy insurance they didn’t want! Never mind that a system almost exactly like this had already worked in Massachusetts. This is in keeping with the historic pattern of conservatives asserting every new progressive reform (from abolition of child labor, to Social Security, to the Clean Air Act and Clean Water Act, to Obamacare) will backfire by violating the natural laws of the unregulated economy, causing misery, and perhaps leading to full-scale socialism. To be sure, there was a plausible mechanism by which the law could fail. The way to kill its exchanges would be to trigger a “death spiral,” in which healthy customers decided not to buy plans, so only sick people remained in the risk pool, driving up costs, and driving out more healthy people, and so on. But Obamacare was actually well-designed with safeguards to prevent such a thing from happening, And by 2016, it was fairly clear the predictions of doom were all totally wrong. The customer base and the rates were stable and profitable. 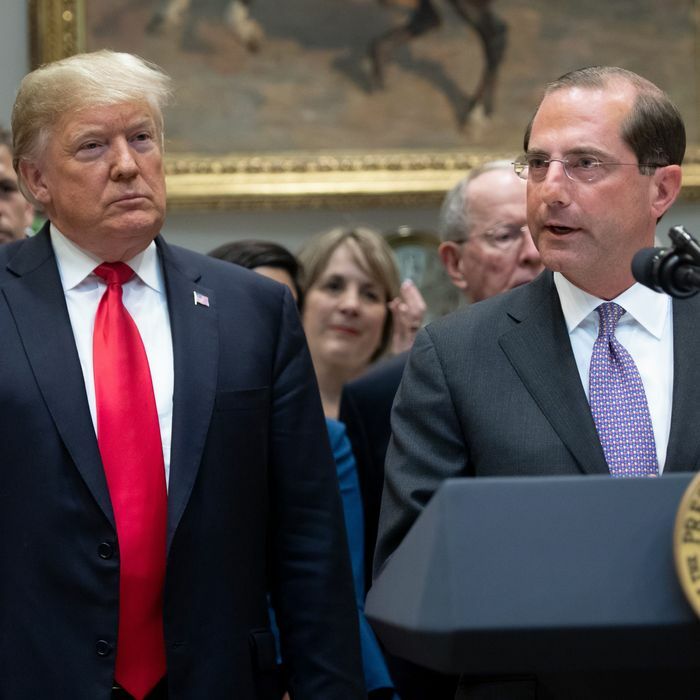 And yet the Trump administration’s extensive efforts to sabotage Obamacare administratively and legally were potent enough that many health policy analysts thought the administration could actually reach the intended effect. Republicans could trigger the death spiral they had predicted, and then would argue it was Obamacare’s fault and was going to happen anyway. Indeed, Trump was arguing this. 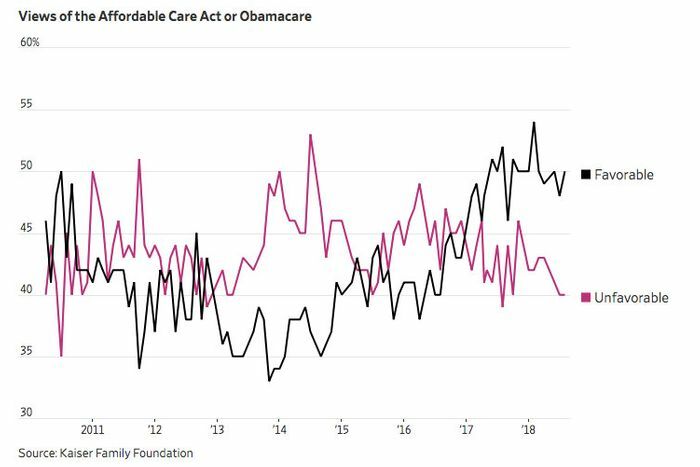 All the uncertainty around Obamacare fomented by the administration, and the repeated steps to undermine it, had their effect: premiums shot up during Trump’s first year. States that took steps to counteract the sabotage have seen their premiums drop sharply — in New Jersey, for instance, a state controlled by Democrats, premiums will fall by 14 percent. If Democrats regain control of government, they could implement similar steps very quickly and bring down rates. But even in the majority of states, where Republicans have blocked such action, premiums are largely stable. There is no death spiral. Obamacare has lived. And conservatives will have learned no lessons from their failed predictions.